Now that the world had a functional all-electronic television system and a way to broadcast a signal to receivers, the question then became: who was going to pay for programming? In the United Kingdom the answer was to have television owners pay for a license fee to operate them, which then funded the BBC, but in capitalist America that wasn’t really an option. American radio had solved their funding problem by first introducing advertising breaks masquerading as station identification, and then eventuating in program sponsorship – by the late 1940s they had monetised every little nook and cranny they could find, even the weather report was brought to you by someone or another. But one of the things they had found worked the best for making money were radio “serials” – an audio-only version of the popular episodic genre shorts that ran in the movie theatres. Early radio programme producers quickly realised serials would be perfect for selling advertising, which was, after all, their product. Serials typically had a hero who battled some sort of evil but ultimately survived to return every week (or weekday afternoon) and do it again, making them easy idols for children to adopt. While these fictional heroes had done well returning audiences to movie houses, they also made the perfect spokespeople for selling their young radio audiences toys and cereal. Hi-ho Silver, away – but not before you eat your Wheaties. And every box now has a sheriff’s badge inside, so you can fight the bad guys too! Yee haw! It was a “golden age” for the townsfolk of Radioville, until one fateful day when Television rode into town on a black horse, wearing a yellow hat and a red bandana… aw shucks, Television doesn’t need to describe what it looks like, it can show you! The shootout in the town square between Sheriff Radio and the outlaw Television was short. The sheriff was dead and Television ran off with all the serials. Radioville would never be the same. After that, the serials were back on the screen, like in the movie houses, but they were selling products not seats, like on the radio. And they did a good job at it. But science-fiction serials benefitted from the move most of all, because while a half-dozen sound effects told you all you needed to know in a radio Western, they didn’t help much in describing a futuristic space-age – you really needed pictures for that. 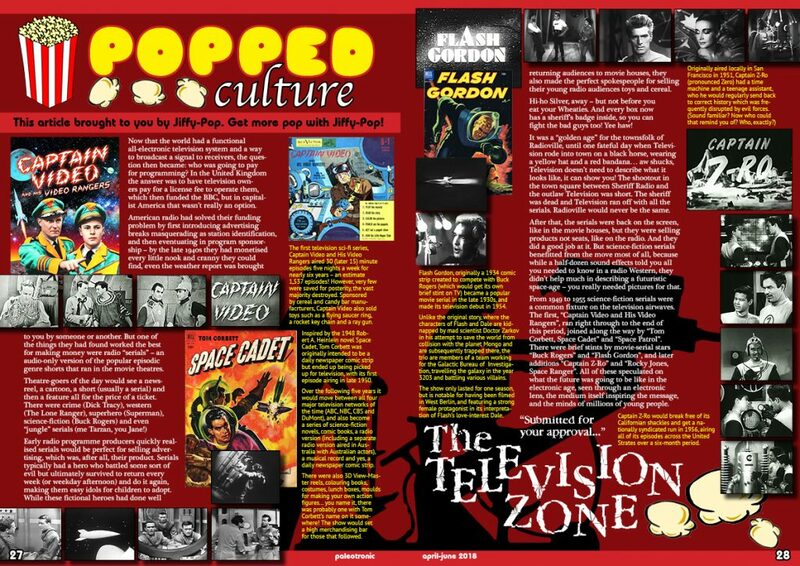 From 1949 to 1955 science-fiction serials were a common fixture on the television airwaves. 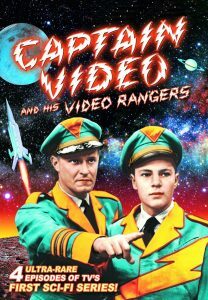 The first, “Captain Video and His Video Rangers”, ran right through to the end of this period, joined along the way by “Tom Corbett, Space Cadet” and “Space Patrol”. There were brief stints by movie-serial stars “Buck Rogers” and “Flash Gordon”, and later additions “Captain Z-Ro” and “Rocky Jones, Space Ranger”. All of these speculated on what the future was going to be like in the electronic age, seen through an electronic lens, the medium itself inspiring the message, and the minds of millions of young people. But as exciting as that was – at least in the beginning – the budgets for these programmes weren’t large and after a few years the stories, sets and costumes became repetitive and boring. By 1955 the public began yearning for the westerns of yesteryear, and the science-fiction serials were shelved. However, science-fiction didn’t disappear entirely – it was realised in the early 1950s that space stories could be used to sell cars just as well as cereal, and the first anthology series – where each episode had a self-contained plot with different characters and actors – “Tales of Tomorrow” debuted in 1951, to be followed by “Science Fiction Theatre” and “The Twilight Zone”, the last one cementing science-fiction into the mainstream forever. “The Twilight Zone” would open the door for a new sub-genre of science-fiction television, the space opera, which featured larger casts of characters and more dynamic plots and messaging than the simplistic space serial’s heroic battles between good and evil. But that’s a region of uncharted space we will boldly go and explore at another time. For now, you can join the Paleotronic Space Rangers club for an entry fee of only $5, sent along with your name and address care of this station. Stay strong, Space Rangers, and see you next week! The first television sci-fi series, Captain Video and His Video Rangers aired 30 (later 15) minute episodes five nights a week for nearly six years – an estimate 1,537 episodes! However, very few were saved for posterity, the vast majority destroyed. Sponsored by cereal and candy bar manufacturers, Captain Video also sold toys such as a flying saucer ring, a rocket key chain and a ray gun. 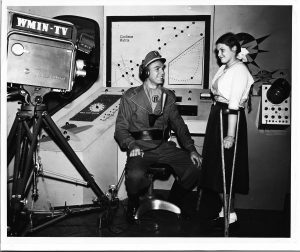 Inspired by the 1948 Robert A. Heinlein novel Space Cadet, Tom Corbett was originally intended to be a daily newspaper comic strip but ended up being picked up for television, with its first episode airing in late 1950. Over the following five years it would move between all four major television networks of the time (ABC, NBC, CBS and DuMont), and also become a series of science-fiction novels, comic books, a radio version (including a separate radio version aired in Australia with Australian actors), a musical record and yes, a daily newspaper comic strip. There were also 3D View-Master reels, colouring books, costumes, lunch boxes, moulds for making your own action figures… you name it, there was probably one with Tom Corbett’s name on it somewhere! The show would set a high merchandising bar for those that followed. Flash Gordon, originally a 1934 comic strip created to compete with Buck Rogers (which would get its own brief stint on TV) became a popular movie serial in the late 1930s, and made its television debut in 1954. Unlike the original story, where the characters of Flash and Dale are kidnapped by mad scientist Doctor Zarkov in his attempt to save the world from collision with the planet Mongo and are subsequently trapped there, the trio are members of a team working for the Galactic Bureau of Investigation, travelling the galaxy in the year 3203 and battling various villains. The show only lasted for one season, but is notable for having been filmed in West Berlin, and featuring a strong female protagonist in its interpretation of Flash’s love-interest Dale. Originally aired locally in San Francisco in 1951, Captain Z-Ro (pronounced Zero) had a time machine and a teenage assistant, who he would regularly send back to correct history which was frequently disrupted by evil forces. (Sound familiar? Now who could that remind you of? Who, exactly?) Captain Z-Ro would break free of its Californian shackles and get a nationally syndicated run in 1956, airing all of its episodes across the United Strates over a six-month period. Rocky Jones, Space Ranger was recorded using film instead of television cameras, which allowed for more elaborate sets, outside / off-studio scenes and better special effects. Most episodes have survived and can be watched on YouTube. Science Fiction Theatre was a sci-fi anthology series broadcast from 1955 to 1957. Each week had a new story and cast. The first season was filmed in colour, which was notable for the time. Head writer Rod Serling also hosted The Twilight Zone, with his trademark cool and dispassionate style often in sharp contrast to the strong moral and emotional messages embedded in his own screenplays. The anthology series launched the careers of a number of actors, including Star Trek’s William Shatner. Serling believed science-fiction would allow him to explore more controversial social concepts without interference from the networks. 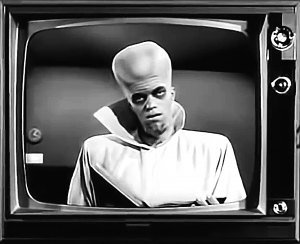 A famous example is the episode “To Serve Man”, where an alien attempts to sell humanity on the benefits of “co-operation”, when the true intent is much more sinister –a not-so-subtle commentary on imperialism. CRTs didn’t just make good televisions, they also made great windows into the world of computers. Prior to CRT monitors, interfaces with mainframe computers were typically panels of lights or paper printouts. But in the 1960s some mainframes were equipped with oscilloscope CRTs which could do vector graphics, and with reduced memory costs in the early 1970s, monitors capable of displaying text became practical. These were known as terminals since they connected to their mainframe host externally, (usually over a network) and had their own built-in computer for displaying information and managing communications. In the mid-1970s, microcomputers began to connect to monitors directly, enabling the development of better graphical capabilities such as the ability to draw raster-based shapes, later in colour. These improvements led to the rise of video games. 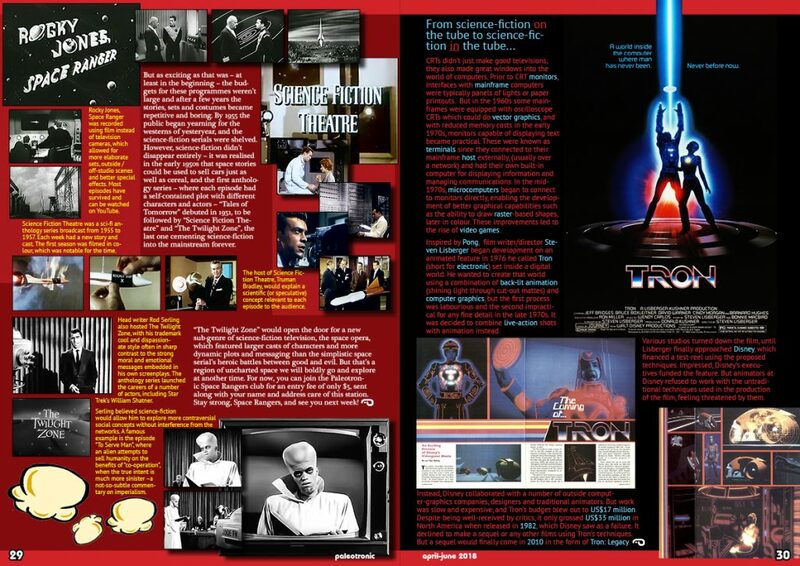 Inspired by Pong, film writer/director Steven Lisberger began development on an animated feature in 1976 he called Tron (short for electronic) set inside a digital world. He wanted to create that world using a combination of back-lit animation (shining light through cut-out mattes) and computer graphics, but the first process was labourious and the second impractical for any fine detail in the late 1970s. It was decided to combine live-action shots with animation instead. Various studios turned down the film, until Lisberger finally approached Disney, which financed a test-reel using the proposed techniques. Impressed, Disney’s executives funded the feature. But animators at Disney refused to work with the untraditional techniques used in the production of the film, feeling threatened by them. Instead, Disney collaborated with a number of outside computer-graphics companies, designers and traditional animators. But work was slow and expensive, and Tron’s budget blew out to US$17 million. Despite being well-received by critics, it only grossed US$33 million in North America when released in 1982, which Disney saw as a failure. 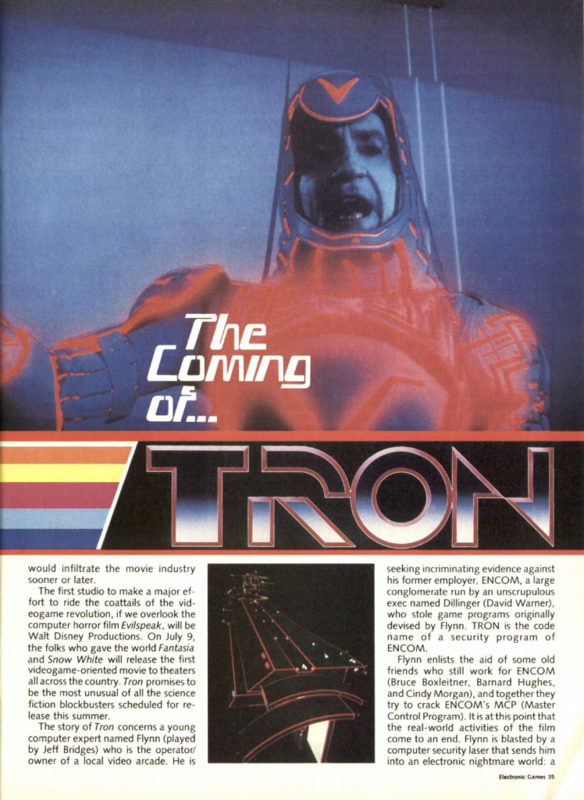 It declined to make a sequel or any other films using Tron’s techniques. But a sequel would finally come in 2010 in the form of Tron: Legacy.